The Department of Livestock Husbandry has said intensive efforts would be made to boost exports of animal products this year. The livestock sector has enjoyed annual average growth of 5-6 per cent for the last two decades. Meat production has more than tripled since 2005 from 1.6 million to 5.3 million tonnes, egg production has almost quadrupled and milk output has increased 18.6 times, it said. Nguyễn Xuân Dương, the department’s acting director, said, for the first time in the history, Việt Nam exported chicken to Japan in 2017, and last year marked the beginning of pork exports to Myanmar. To enhance exports, the sector needs to improve productivity, quality, cut production costs and ensure hygiene and food safety, he said. To reduce production costs and increase productivity, besides choosing high-quality strains, “We need to restructure the sector with production based on linkage chains,” he said. Enhancing linkages between businesses, co-operatives, business groups and small farmers and breeders is very important for developing the sector in a sustainable manner in terms of efficiency, food safety, environment, and exports, he said. 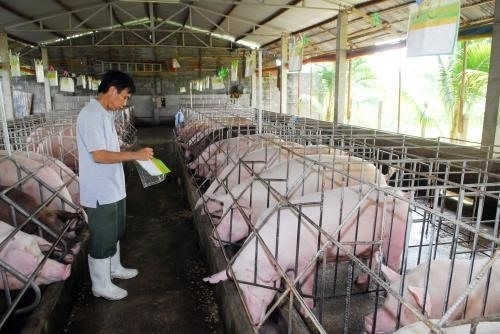 In addition, with animal feed accounting for 70 per cent of costs, reducing feed prices is very important to cut costs and improve the competitiveness of Vietnamese livestock products, he said. The Government has cut tariffs on imported raw materials for animal feed, and producers should cut costs to reduce feed prices, he said. Last year many large enterprises such as Masan, CP, Dabaco, and Ba Huân have invested in meat processing facilities, experts said. Masan opened a VNĐ1 trillion (over US$43 million) meat processing complex in Hà Nam Province. The 10ha complex can process 140,000 tonnes of pork a year and uses Danish technology. Most large companies have invested in all stages from breeding to processing, and the investment made by these firms is important and contributes to the development of the industry, they added.